Collaborators and other interested university members at one of the PICT gatherings in May 2018. Dr. Parkinson and Dr. Mukherjee, who collaborated on literature classes in Canada and India during the university term, met in Saskatoon this spring to discuss expansion of the project. Two instructors in the Department of English, Professors David Parkinson and Lisa Vargo, recently paired with literary studies instructor Dr. Payel Chattopadhyay Mukherjee of Ahmedabad University in India to launch the Project in International Collaborative Teaching. PICT is a cross-cultural teaching and learning model that offers internationalization for students, instructors, and researchers. Two instructors from different institutions and cultural contexts collaborate to link their courses and thus their students. Students learn from both instructors as well as from each other, as they engage critically with a complex question or issue of shared importance in both contexts. At the same time, students and instructors increase their awareness of the intersecting and varying ways in which research and scholarship are conducted across regional, national, and other boundaries. While PICT may be suitable in advanced seminars or when an intercultural component is not significant, the program comes into its own in first-year classes in which this component is foundational. In literary courses, questions about culturally-based interpretation can come to the fore. In the paired courses offered in 2017-2018 by Professors Parkinson and Mukherjee, two especially challenging readings were Mahasweta Devi’s “Behind the Bodice” and Barbara Gowdy’s “We So Seldom Look on Love.” The exaggerated, threatening forms of otherness in these two short stories engaged students’ interest and elicited thoughtful, searching, substantial writing. The project is being expanded this year, with the involvement of more international universities and more instructors at the University of Saskatchewan, including in departments other than English. The manual for the Project in International Collaborative Teaching is now ready, and the PICT team has prepared a website to make the initiative available for wider consultation and use. Please see https://uofs-pict.com/. The project has received funding through the International Research and Partnerships Office and the Gwenna Moss Centre for Teaching and Learning, allowing the value of PICT for international undergraduate research to be tested. Those interested in participating or hearing more about the project should contact project leader Dr. Parkinson. Click here for a news article on the project and click here for the project website. 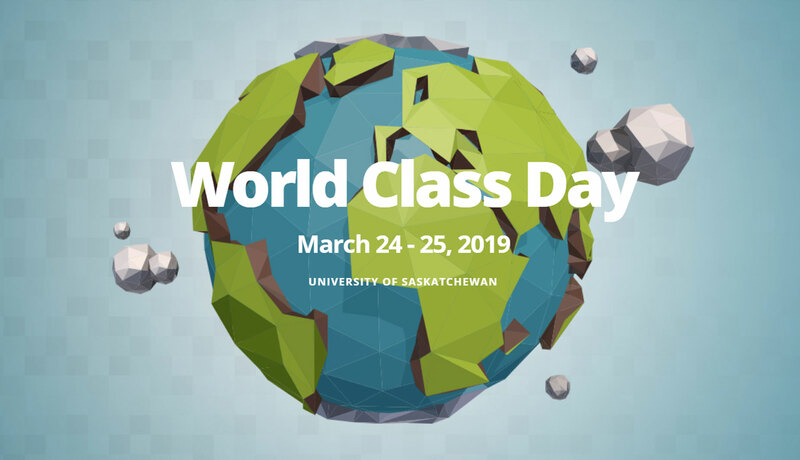 The first World Class Day, a one-day online international conference for undergraduate students, will take place March 24-15, 2019. This micro-conference offers participants international exposure to — and engagement with — a diversity of perspectives, approaches, and discoveries by undergraduate researchers around the globe. By live video link, students will present snapshots of projects they have undertaken as part of their regular studies. Within five minutes, they will provide a focus and motivation for their research, identify a key finding, and anticipate next steps. Getting ready for the event, each student presenter has worked with a peer mentor who is familiar with the format and style of a student research micro-conference. Please see more information and the schedule to join in by WebEx below.